In the last hundred years, fossil fuels have changed the life of human society in a fantastic way. Human mobility, new composites, and petrochemicals have dramatically improved the quality of life in the developed world. The broad use of charcoal for electricity generation, particularly in North America and Europe, has allowed industry to grow very fast and at a low cost, based on a large consumption of energy on a per capita basis. As a consequence, emissions of air pollutants by transportation systems based on fossil fuels have imposed major losses in health quality, particularly in big cities. Greenhouse gas emissions are expected to reach critical values by the end of this century, endangering the maintenance of life on our planet. The consequences of keeping up the same pace of energy consumption based on fossil fuels are already well known, and a major concerted effort among all nations is necessary in order to prevent global warming. Renewable energies are the best solution for maintaining the growing demand for energy and at the same time avoiding the problems caused by the use of fossil fuels. One of the reasons for adopting renewable energy alternatives is the fall in their production costs, making them highly competitive with other sources of energy. Biomass is more and more becoming an alternative for the production of biofuels, as well as becoming the raw material for a newborn chemical industry based on renewable sources. 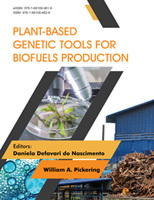 In the following chapters, the reader is presented with several topics related to biomass production, from plants to algae. Modern techniques applied to plant tissue culture, genetic transformation, plant breeding, and functional genomics are presented in a smooth and highly informative way. The growing dependency on energy derived from depleting supplies of fossil fuels no longer has a future. The combustion of oil as an energy source is one of the biggest causes of air pollution, due to the releasing of CO2 in the environment. Solar energy, on the other hand, when captured by plants through photosynthesis, promotes the assimilation of CO2 and results in the opposite of the “greenhouse effect”. Increased demand for fuels of vegetable origin, in addition to their environmental appeal, has made these fuels an appealing alternative and increased their production possibilities. This is where the need has arisen for the application of different biotechnological techniques, such as viable biomass production, development of cell wall degrading tools, and efficient fermentation technology. The choice of biomass species is a key step in the production of biofuels with high oil and carbohydrate content. There is a great potential for the use of different kinds of crop residues for the production of bioenergy. After sugarcane juice is extracted, the remaining biomass (bagasse), rich in cellulose, can be used for second generation biofuel. A similar process can also be performed using corn stover, municipal solid wastes, and forestry residues. Evidence suggests that the current production of biofuels is at less than capacity. This is considered to be due to a confluence of factors, including high feedstock and processing costs, regulatory frameworks, risk avoidance, and limits to the amount of biofuel that can be blended with conventional fuels in major markets. The use of cell suspension, somatic embryogenesis, gametic embryogenesis, and protoplast fusion, presented in chapters 1 and 2, give some insight into the ways that these techniques can be used to produce renewable fuels. Biomass feedstock production may benefit from the identification and characterization of key proteins involved, for example, in the biosynthesis of cell wall components and oil bodies. In this context, as seen in chapter 6, the exploration of subcellular proteomes also shows great promise in the characterization of new protein families and regulation mechanisms for improved biofuel crops. As discussed in chapter 4, new plant breeding techniques comprise a group of methods that offer the possibility of performing precise editing, replacement, or insertion of genes, targeting specific genomic regions without the use of any selectable marker. These features minimize the probability of undesirable random gene disruption, thereby providing interesting alternative tools for genetic transformation. The new tools are more predictable and less prone to position effects than are conventional methods. All living organisms are constantly exposed to a variety of DNA-damaging agents. Chapter 3 shows that mutations in DNA are frequently observed in several diseases, a factor which is reflected in metabolic changes of great importance in biotechnology and biofuels production. It is seen in Chapter 5 that viruses constitute very powerful targets or tools for plant biotechnology applications. Plant viruses can be efficient vehicles for heterologous gene expression in plants used as biofactories or biofuels sources. Biotechnology is playing a major role in new advances in the fermentation of different substrates and in the production, not only of ethanol, but of biodiesel, butanol, and many other biofuels, as described in chapter 9. Genomic resources and bioinformatic tools are available for plant species with bioenergy and biofuels potential, and these are presented in chapter 7. Plant biomass is the main feedstock for biofuels production. Efforts to maximize yield per unit of production area are of crucial importance in meeting the rising demand for renewable energy sources. In chapter 8, a broad overview is given of the factors influencing biomass yield, of advances in cultivation technologies, and of the relation of these conditions to the physiology of energy crops. The chapter also presents innovative technologies that can support management decisions, focusing on sugarcane as a model for bioenergy crops. Microalgae biomass has also been described by several authors as an alternative with great potential for accomplishing the goal of the replacement of diesel by biodiesel, while at the same time not competing with fertile land useable for food production. However, the technology must still overcome a number of obstacles in order to be widely deployed. The advances and challenges of the technologies used, including procedures for obtaining biomass, are presented in chapter 10. As is clear from the above discussion, this eBook is aimed at addressing sustainable biotechnological techniques that have been applied in the search for significant increases in biofuel productivity, without affecting food production. It is expected that the lessons from the sustainability criteria applied to first generation biofuels will be incorporated into advanced biofuels production, not necessarily focusing on the type of supply, but instead on existing local demands and domestic development strategies.